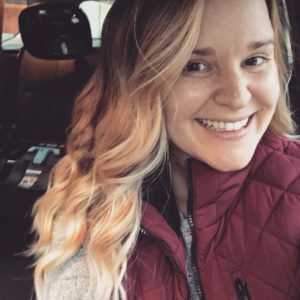 As a mama, I am always looking for ways to make life a little bit easier and more predictable. Haha…predictable, yeah right! No, but seriously, I am always trying to find ways to make raising a small child a little bit easier. 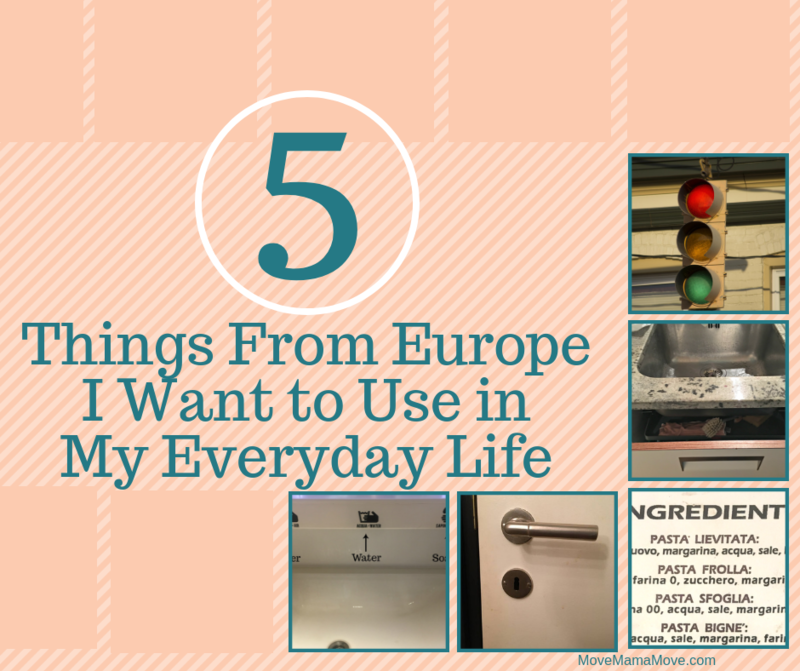 When we traveled to Europe last month, there were five things I saw that I would love to see implemented in my daily life here in the US. 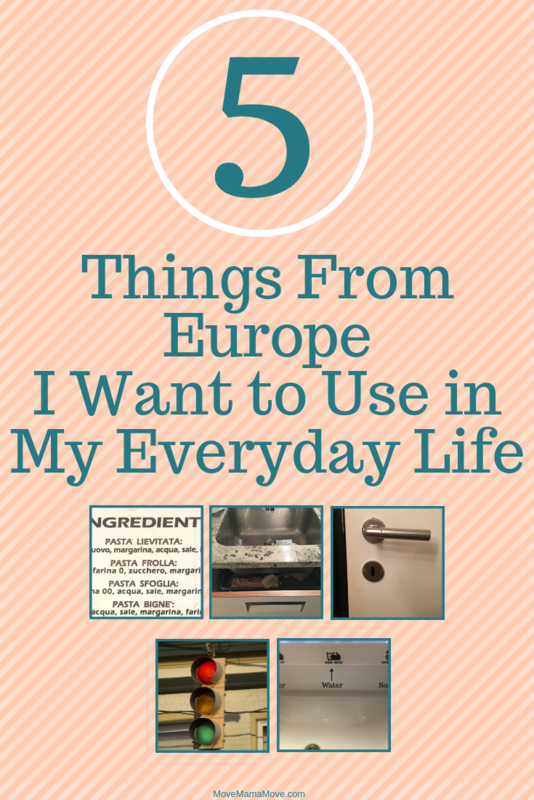 Below are five things I wish I can use, see, or experience on a regular basis here at home. These door locks were brilliant. Inside our vacation rental, each door had a keyhole on both sides. For example, the bathroom had a keyhole on the inside and the outside. The door could be locked from either side, using a key. Our current apartment has so many obnoxious looking babyproofing contraptions to keep Chulengo out of harm’s way. The doors we have in our apartment at home only lock from one side. For example, our downstairs bathroom locks from the inside. I have attached a door handle blocking mechanism to the outside of the bathroom door to keep Chulengo from going into the bathroom when it is not in use. This is inconvenient for a couple of reasons. First, there is a big obnoxious white plastic object attached to our dark walnut doors. Second, it can be difficult to open. I once forgot to show our sitter how to open the handle blocker, and she wasn’t able to use our downstairs bathroom because she couldn’t open the door. Third, the handle blocker attaches to the door with an adhesive backing. So, it is not the most secure. I am sure after a couple of months; Chulengo will figure out how to pull it off. And if he can’t get it off, we will spend a lot of time trying to remove the handle blocker without damaging the door when we move out of our apartment. 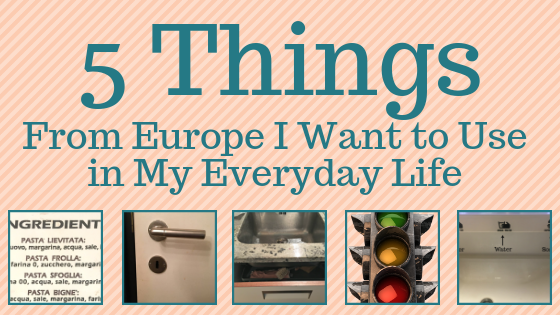 While we were in Europe, if I needed to keep Chulengo from going into a room, I could lock the door from the outside. If I needed to keep Chulengo inside a room with me, I could lock the door from the inside. These double-sided door locks would eliminate unnecessary baby proofing gear to keep Chulengo out of rooms and closets. They are more convenient, functional and aesthetically pleasing than what we currently have in our home. 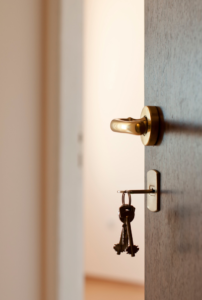 I loved that the same key worked for both sides of the door and any lock in the house. If I had these locks in my house, I would keep multiple keys throughout the house for quick and easy access. Do you know how long it took me to find the garbage can in our recent home rental in Switzerland? I eventually found the trash under the sink. Now you might think, woah Lisa, real original to put the trash under the sink, not! But this trash can, along with a recycling bin, a composting can, and cleaning supplies, was in a large gliding drawer hidden perfectly under the kitchen sink. I have never seen under-sink space used so efficiently. If you were to look under my kitchen sink right now, you would find a couple of wire baskets filled with towels and plastic bags, a paper bag full of paper bags, paper towels, and some cleaning supplies. I organized it when we first moved in, but now it is a cluttered mess that I try to re-organize on a regular basis, but I’m never satisfied. In our rental in Europe, the space under the sink was utilized to its full capacity and was convenient. All items underneath were strategically placed to avoid the pipes under the sink. This was the perfect solution to keep Chulengo out of the trash. He was not able to open the drawer because it was so heavy. The kitchen looked sleek, rather than having a dumpy looking trash can in the middle of the kitchen floor. The cleaning supplies were safely hidden but conveniently located. I could dump items in the proper bins while meal prepping which saved time. 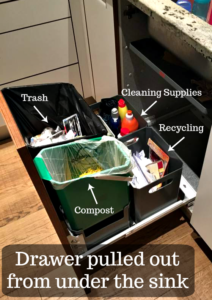 If I get the chance to customize kitchen cabinets in our next home, I will definitely include a large sliding drawer under the kitchen sink for trash, recycling, and compost bins and cleaning supplies to maximize our space. Have you ever been sitting at a stoplight waiting for it to turn green? Of course, you have! But how many times have you started daydreaming as you are waiting? And then, before you know it the light is green and you wonder how long it has been that way? The city we live has insane traffic, so every second of a green light counts. Well, in Geneva, Switzerland I noticed something unique about the stoplights. Did you notice the yellow light after the red light? Odd, right? 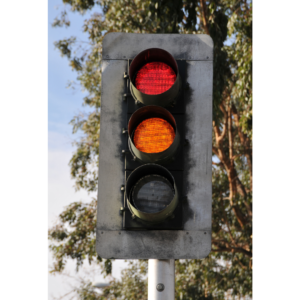 The extra yellow light was helpful because it alerted drivers that the stoplight would soon turn green, the same way it alerts drivers the light is going to turn red. The only difference was the yellow light turned on while the red light was still illuminated, eliminating the confusion of whether the light would turn red or green. If you saw a single yellow light, it meant the light was going to turn red next. If you saw a yellow light with a red light, it meant the light was going to turn green next. This is convenient. I have always used the walking signals to measure how much time until the light turns green, but I love the idea of only focusing on the stoplight ahead of me. Washing Chulengo’s hands in the sink is always a disaster. He constantly reaches for the faucet handle, changing the water pressure and temperature immediately. I always get nervous about the water suddenly getting too hot. Because I am focusing on the faucet handle, Chulengo gets water everywhere, and we both walk away from a handwashing soaking wet. When we are out and about and use a public washroom here in the US, we occasionally see a hand-less faucet. But the faucets here in the US are typically difficult to access when holding Chulengo because they are short and oddly placed, dirty, and the sensors to turn on the water are not very sensitive. I spend a lot of time trying to keep Chulengo’s hands off the dirty faucet and waving my hand around the sink to keep the water flowing to wash his hands quickly. There were two types of water faucets in Europe that I loved. One was an all-inclusive hands-free sink. 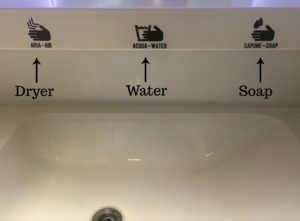 Hands-free water faucet, hands-free soap dispenser, and a hands-free hand dryer. All three were under the counter located above the sink. I could wash Chulengo’s hands without him messing with a faucet handle, changing the temperature, or getting soap everywhere. These sinks were clean because any soap that dropped from the dispenser fell into the sink, where it could be washed away easily. If we were to build our dream house, this would be a lovely addition to at least one of our bathrooms. The second type of water faucet I loved was one controlled with a foot pedal. This was a great idea. I will someday incorporate this idea into my dream kitchen. Turning on the water with my foot, while my hands are full as I prep for a meal sounds like a dream! I would waste less water and be more efficient with my hands. 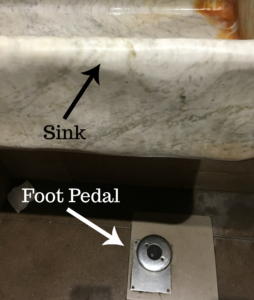 I also love the idea of the foot pedal control in the public bathrooms. I don’t have to touch anything with my hands or constantly wave my hand under a faucet sensor to turn on the water. I could more easily control the water pressure with my feet. I wish the foot pedals were more common in public bathrooms to make washing hands even more sanitary. Okay, this one requires a little bit more explaining. Yes, there are restaurants in the US that describe their dishes on the menu. But in Europe, I noticed every menu had a list of each ingredient in a recipe. This was amazing. When I am picking a meal for myself or Chulengo, I always want to know what ingredients are in the dish. This makes it easy for me to understand what is on the menu without having to ask a number of questions. I can avoid ingredients we don’t like instead of ordering a meal and finding it comes covered in cilantro — my least favorite recipe ingredient of all time. Menus were publicly posted for potential guests to review easily without having to awkwardly ask for a menu. We chose a lot of restaurants based on the menus we studied outside of each establishment. I appreciated getting to look at a menu easily and quickly before deciding on a restaurant.